Once an esteemed Imperial Overseer, Mikilu is now the Ill'haress of the restored Val'Dutan'vir clan. After her exile following the Nidraa'chal War, she had devoted her life to bringing those responsible to justice and reestablishing her once-great clan. Thirty-two years later, her plans bore fruit, and the clan was reformed from the scattered survivors of the clan, as well as fellow mixbloods from the Kyorl'solenurn and Sarghress clans. Mikilu is tall and imposing, owing to her mixed blood. She has green eyes and auburn hair. She wears a headband adorned with an amber stone and tattoos that create stag horns. In the past she wore her hair long in three loose ponytails and long bangs with golden jewelry, but after her exile she pulls it back into an intricate, braided bun that eschews anything luxurious. During her time as an Overseer, she wore the traditional robes of an overseer in colors of the Dutan'vir clan - rich browns and golds. In her exile, she hides herself in dark clothing. In Mimaneid, she wears brown leathers and carries a wooden staff. She almost always covers her lower face with a veil. Mikilu's central characteristic is her loyalty. She was among the most loyal servants of the Val'Sharess, even among the Overseers and Guard. While she loves her clan and desires its return to power, her loyalty to her old station overshadows much of what she does - she did not leave her post when the Dutan'vir fell, and even now she has traveled to Mimaneid in order to secure vengence over Snadhya'runes Vel'Sharen's machinations instead of standing by her clan as they retake their home district. She is also very patient and meticulous. As an Overseer she was both honored and feared for her abilities to discern the politics of various clans she was sent to on Imperial orders. In exile, she spent the better part of 30 years building a system of listeners and actors, to learn as much as she could about what was happening now in the Vel'Sharen as well as in Orthorbbae, even going so far as to testing Snadhya'runes' security with attacks. Even her actions in Mimaneid show she is willing to work hard for alliances to insure her revenge and the position of her clan in Chel'el'sussoloth's future. 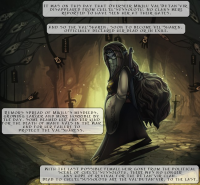 In the wake of the Nidraa'chal War, Mikilu is forced to flee into exile amid false accusations of treachery. Roughly 15 years prior to the start of the main story, Mikilu served as Captain of Imperial Guard. The daughter of Ill'haress Sannindi'ligr Val'Dutan'vir, she became an Imperial Overseer under the rule of Val'Sharess Diva'ratrika, alongside her brother Sker'ligr. As one of the most trusted Overseers of the Empress, she had eventually come to lead them and much of the Imperial Guard by default. Her loyalty to the Empress was even greater than to that of her clan. Alongside Sker'ligr, she was present when Diva'ratrika commanded the Imperial Guard to lead an inquisition of the tainted in response to Nidraa'chal activity. This edict precipitated the disastrous Nidraa'chal War. Participating in the heavy fighting around the besieged Val'Sharen districts, she was drawn away from the interior of the Val'Sharess Tower as the traitorous sisters enacted their coup against the Empress. Responding to reports of Sil'lice assaulting her own kin at the tower, Mikilu returned with Sker'ligr and Overseer Nir'naya. There, they found the tower in ruins and filled with bloody carnage of the Sharen that had remained behind. The trio encountered Sil'lice and Nishi'kanta among the chaos, as the latter lay at the former's feet. Striding forward, Nir'naya accused Sil'lice of being responsible, enraging Sil'lice and causing her to threaten to reach the Queen over their frozen corpses. As Sker'ligr and Nir'naya moved to restrain Sil'lice, Mikilu rushed further into the tower, a desire to locate her Empress surpassing all other objectives. Following the end of the war, Sil'lice escaped into exile and was declared to be a traitor and responsible for the attempt on the Empress's life. With her kinsman Sker'ligr disbelieving these claims and following Sil'lice into exile, Mikilu was left unsure what to believe. Furthermore, the war had less to the effective dissolution of the Dutan'vir clan, with many slain in the war or joining clans like the Val'Sarghress or Val'Kyorl'solenurn. Of those that remained, many were either sold into slavery or committed suicide. 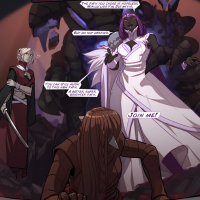 Mikilu was then informed by the remaining Sharen daughters Snadhya'rune, Sarv'swati, and Zala'ess that the Val'Sharess trusted no one and would not meet with her Overseers or Guards until she deemed them loyal, and Mikilu was forced to wait until she was called for. But this call never came, with Nir'naya even selected to replace Mikilu as the Captain of the Guard. Mikilu was "graciously" allowed to remain in her apartments, but she faced insult and ridicule at every turn within the Sharen fortress, with constant ribbing over the new meaning of "Ligr" after her clan's last stand and its failure. Eventually, rumors rose about her being vicious and vile, and she was framed in the murder of her servant and staff in the kitchens after a "prank". Nishi'kanta came forward and told her that her life would not be long if she remained with the Sharen, and that no Empress would be calling for her. Nishi'kanta's warnings were heeded, and Mikilu disappeared without a trace. Even in exile, Mikilu works to avenge her clan. No one knew where Mikilu had gone, though there were rumors that she left for another city. Even the Dutan'vir among the Mae'yukir house of the Sarghress presumed that their Val line had been extinguished with her disappearance. But Mikilu did not go far. She hid within the slums of Chel'el'sussoloth and began to covertly gather information on Snadhya'runes and the Vel'Sharen. She employed the use of two street urchins, Cer'kal Veru'ur and Taio'shi, the latter of which looked to Mikilu as an adoptive mother. They supplied her with necessities and kept her informed about the talk on the street. They even ran guerrilla missions against the Sharen sisters to test the security of the women, notably attacking Snadhya'runes' carriage as she escorted Mel'arnach Val'Sarghress to the Sarghress fortress. She revealed herself to her kinsmen, Sker'ligr and Minka Sann'ligr Val'Dutan'vir by the end of the year 1098 of the Moonless Age, and the three discussed the resurrection of their former clan. Mikilu meets with the Kavahini Illhar and the two loyal daughters of Diva'ratrika to discuss an alliance against Felde. While former Dutan'vir, led by Sker'ligr and Minka, overthrew Kyorl'solenurn forces at the old Dutan'vir holdings, Mikilu was not present. Instead, she had been spending a year in Mimaneid learning the ways of the locals and attempting to drum up support for Sil'lice's cause against Snadhya'runes. Illhar Ulvakhi Kavahini answered her call, and together the two worked on a plan to strike at Felde, Snadhya'runes' base city. With the Felde Gathering recently announced and Zala'ess returning with allies to Chel'el'sussoloth in order to turn the tide of battle against the Sarghress, Sil'lice and Nishi'kanta are torn on what to do - ensure the Sarghress victory with their new allies, or grab at the opportunity to take down Snadhya'runes and her allies. Mikilu and Ulvakhi press for the Felde initiative. Snadhya'rune attempts to convince a defeated Mikilu to ally with her, leaving Lulianne's loyalties conflicted. Miki'lu's Mimian forces launched an offensive on Snadhya'rune's Feldian estate shortly after the Sarghress infiltrators invaded, causing much chaos to the First Daughter's property and driving away party attendees. As the main body attacked the defenses, Miki'u took a strike force to target Snadhya directly in a prepared ambush. She engaged Khaless in a duel and quickly overpowered the demon with earth sorcery, though decided to show mercy at the last moment upon seeing Lulianne's Dutan'vir hair pendant. She told the woman to go home, referring to the successful recapture of their ancestral fortress; the Dutan'vir warrior's personality could not believe that Miki'lu was alive and claimed that she could have held the survivors of the purge together. However, their reunion was cut short by Khaless forcing her way back into control while Snadhya'rune looked on with amusement. The Dutan'vir survivor would not take Snadhya'rune's smugness lightly, with a great declaration of seeking revenge for her slain friend Diva'ratrika and the clan Miki'lu saw fall to ruin. Calling on her Mimian team, she launched an earth sorcery assault on Snadhya--who had used her own earth sorcery to raise summons and a shield around herself--and the two fought in the hallway as the First Daughter's minions took on the strike team. As Miki'lu struggled against the summoner's defenses, Snadhya mercilessly taunted her with words about the failure of the old orders of Chel, and how the Dutan'vir ought to join her rather than continued down a doomed path. Miki'lu throws the offer out the door, urging "Lulianne" to resist Snadhya's control, who herself had been struggling with the demon to remain coherent. Snadhya saw this inner turmoil and pushed Khaless to regain herself, though to no avail--the presence of Miki'lu struggling in the name of the clan pushed Lulianne's personality just far enough to commit an honorable suicide and robbing the Nidraa'chal leader of her most valuable asset. Upon being stabbed in the back by one of the Sarghress infiltrators, Snadhya'rune went on a rampage with indiscriminate smashing of allies and foes alike, and Miki'lu wasted no time by get escaping with what remained of her strike force. Mikilu is finally reunited with Minka and the rest of her clan. Some time later, the Dutan'vir leader had returned to a changed Chel'el'Sussoloth--the Vel'Sharen remnants had allied with the Sarghress, who had been patrolling the streets and making movement difficult for her. 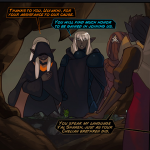 More importantly, Miki'lu took care to avoid detection by suspicious mixblood Kyorl'solenurn and Mae'yukir, even going so far as to pull one dressed in the Dutan'vir colors aside for questioning. To her surprise, Mal'ligr Dutan'vir told her that the suspicious troops were actually former Dutan'vir who had finally come home. AS they walked into the fortress--scarred by battles with the previous Holy Mother Valla'drielle Val'Kyorl'solenurn, he explains that many Dutan'vir had been returning to the ancestral fortress following the end of the war, some spurred on by Dev'ess Itan'sha. At last, Miki'lu's dream had come true, for she saw Minka standing in the throne room of the previous Illhar'ess, relieved and happy to greet her. "I fear for our future if the Nidraa'chal are not eliminated to the last woman very soon." - Overseer Mikilu'ligr's report on the growing civil war in Chel. "There is naught to return to! My life is pledged, the Queen knows this." - Responding to Snadhya'rune's suggestion that she return to her home while awaiting the Val'Sharess' summon. "If it were not for the two of you, I too would be dead on treacherous Sharen blades." - Addressing Nishi'kanta and Sil'lice at the Kavahini fortress. This page was last modified on 16 October 2018, at 17:23.